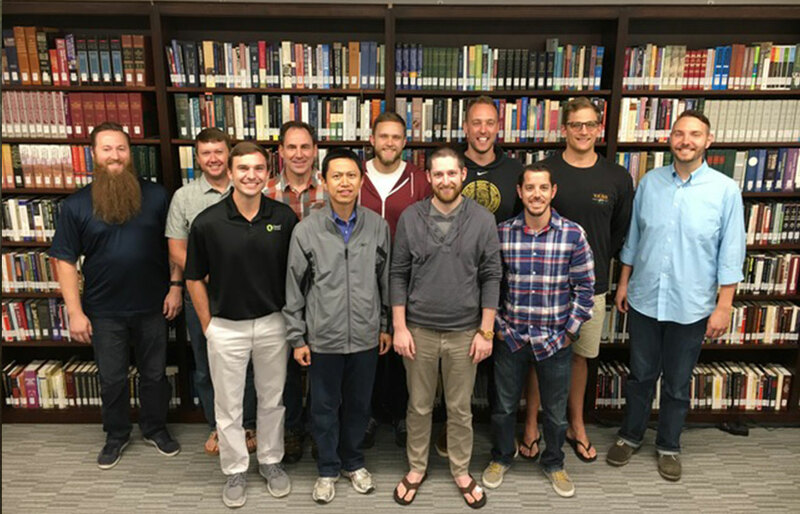 The men of the Pastors College Class of 2018 have arrived and with them much exuberance, laughter, and joy. We are only two weeks into the new academic year, but already we find ourselves deeply grateful for these men, their wives, and their families. I wish I could personally introduce you to each one of them – the picture below will have to suffice for now. Here’s what I can tell you at this point: the grace in the lives of these men and their families has filled us with much faith for the coming year and for the future of ministry that awaits them. (plus, we just really like them). But there’s something the picture below cannot show – the pastors and churches and people that stand behind these men. Whatever effectiveness God grants to the Pastors College is directly proportional to the quality of men our churches send to us. That’s why, beyond the students themselves, this class represents some precious things related both to our history and the unity we enjoy in the mission of the gospel. It represents Sovereign Grace pastors and churches who have long modeled faithfulness in serving the Savior and in investing in the next generation of church leaders. The Pastors College simply wouldn’t exist without you. It represents the fruit from church plants and church adoptions: four of our churches are sending their very first PC student this year. Three church plants and one adoption. It is humbling to see these churches so eagerly and sacrificially pursuing our mission together. It represents a maturation and progress among pastoral teams: one of the students was already a bi-vocational elder, while five were serving internships or in part-time ministry positions. It represents the joy of our global partnerships: Sovereign Grace Church of Sydney, Australia sends its first student to the Pastors College this year. One student is from Nottingham, England who has already interned with our church in Bristol, England. Another student from Louisville comes originally from China and plans to return. It represents the power of partnership through the generous financial support of many who have supported these families, whether individually, through Sovereign Grace, or through their local churches. All this is yet another illustration of the benefits of our union together in Sovereign Grace: we can do far more together than we could ever do separately. As this year unfolds, would you consider joining us in consistent prayer for this Pastors College class? Here’s how we’re praying: for God to be powerfully present to and powerfully at work in every student, spouse, and child; that each one would be transformed by God’s glorious grace, and equipped for all God is calling them to be and to do; and all for the glory of Christ and the cause of the gospel. As Director of Theology and Training for Sovereign Grace, Jeff Purswell is the Dean of our Pastors College, leads our theological training, and helps develop theological resources. He is also an elder at Sovereign Grace Church of Louisville. He and his wife, Julie, have two sons.